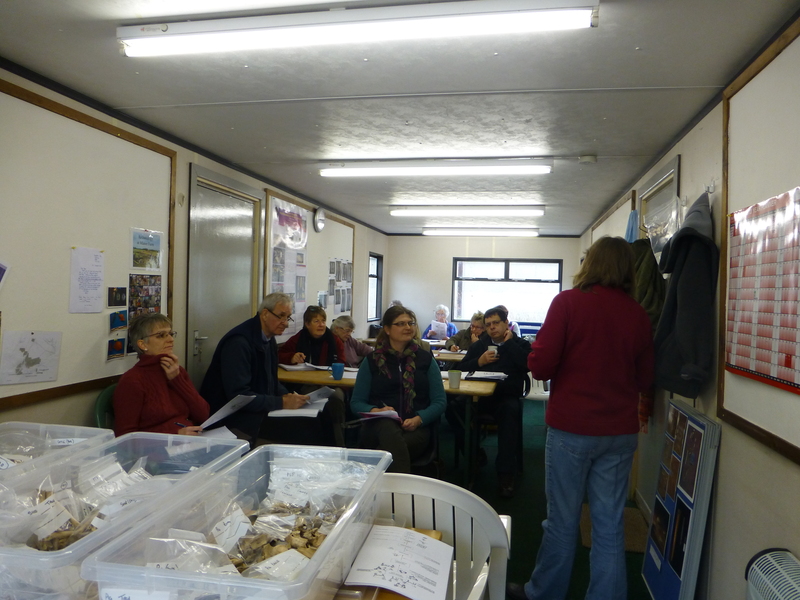 Regular training sessions for both staff and volunteers are an important part of the Trendles Project and on the 11th March we were pleased to invite our animal bone specialist Priscilla Lange back to talk to us about how she prepares animal bone reports for publication. The bones we are analysing at the moment are from the Roman period, with the majority from animals that have been domesticated for food, sheep being particularly popular, but also cattle and pig. Occasional finds of deer bones show that hunting occurred on a very small scale and we can also see that horse, dog and possibly cat were present around the site during that period. We have been intrigued to find what we think are pheasant bones amongst the bones recovered from Trench 18, the area of shops and food stalls directly outside the temple. Priscilla confirmed that the Romans were responsible for introducing pheasants into Britain and they are usually associated with high status sites, which of course Trendles is. Priscilla will look in detail at the bones we are identifying from the Roman and Iron Age periods, calculating the minimum number of individuals for each species across each trench to see if diet changed over time and, where possible, the age at death. 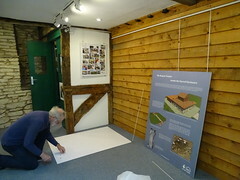 If lots of very young animals are in the assemblage then dairying might have been important, if the animals were killed just as they reached their prime then they were probably being raised for meat, and the cuts of meat the bones represent will tell us something about the prosperity of the site. It might also be possible to determine what activities were taking place. Amongst the bones we are finding bone tools, fragments of bone pins and off-cuts from bone-working and perhaps we will be able to determine the location of small workshops. We still have a long way to go, but already the bones, along with all the other finds from Marcham, are beginning to show how the story of life and lifestyle in Iron Age and Roman Marcham might unfold. How much can you learn about animal bones in about 6-months? As part of the project’s objective, a group of us started sorting animal bones in preparation for the expert who has to further analyse them and prepare the specialist report. The first task was to try to sort the bones into species: horse, cattle, pig, sheep/goat, and large, medium and small mammals where it is not possible to identify them closer. This is easier said than done when you have no clue about skeletons or bones, never mind knowing the name or where it is in a body. With hindsight we were pretty awful at the start, but it is very satisfying to correct yourself at a later date. There is an extensive reference collection of the most common bones. Of course, not all bones are in this collection, but manuals and photographs are available. 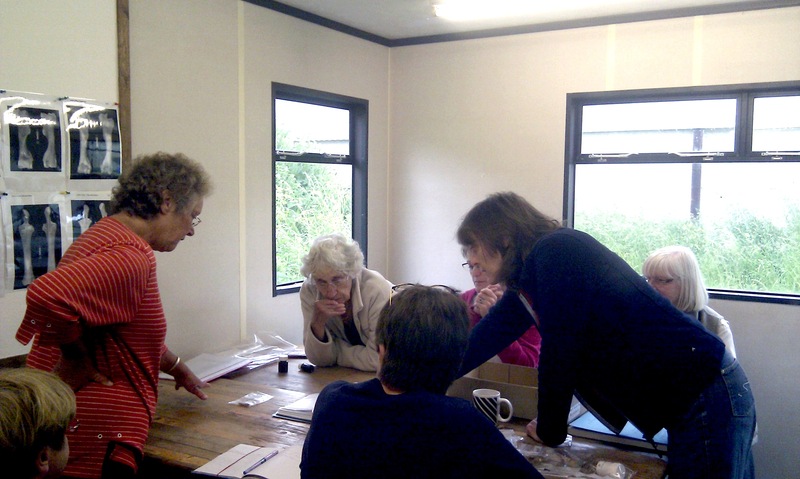 There were some non-domestic animals to be identified which was rather difficult, but we had visits from the expert, Priscilla Lange, to help us with this task. We also have managed to add to this sample collection. Part of the fun for me was the experimental archaeology part of it which meant talking to the local butcher, get some unusual part of a skeleton and clean them at home, by boiling them for hours! There are still some bones buried somewhere in my garden. It was good fun to go through the whole process and, hopefully the expert will appreciate the trouble we went through to help her out! The next stage for our group is to do some stratigraphy – a context number list of all the trenches for the experts. What a challenge! We are busy systematically sorting and identifying to species the animal bones from the trenches excavated in the grounds of the former Noah’s Ark Inn. Two bones, a cattle and sheep metapodial have been found which are smooth and highly polished, most probably through repeated use. Bones such as these have been found on archaeological sites around the world and their function is uncertain but they are thought to have been used as informal tools, possibly as burnishing or rubbing instruments to clean hides of hair or to rub fat into hides to make them waterproof. Experimental archaeology testing these processes has shown that the surface of the bone develops a polish similar to that seen on the bones from archaeological sites. The sheep metapodial also had a small number of narrowly-spaced grooves at one end of the bone. The grooves are distinct from butchery marks, being very smooth and polished as if the grooves were created through wear, possibly as yarn or narrow leather strips were repeatedly passed across it. 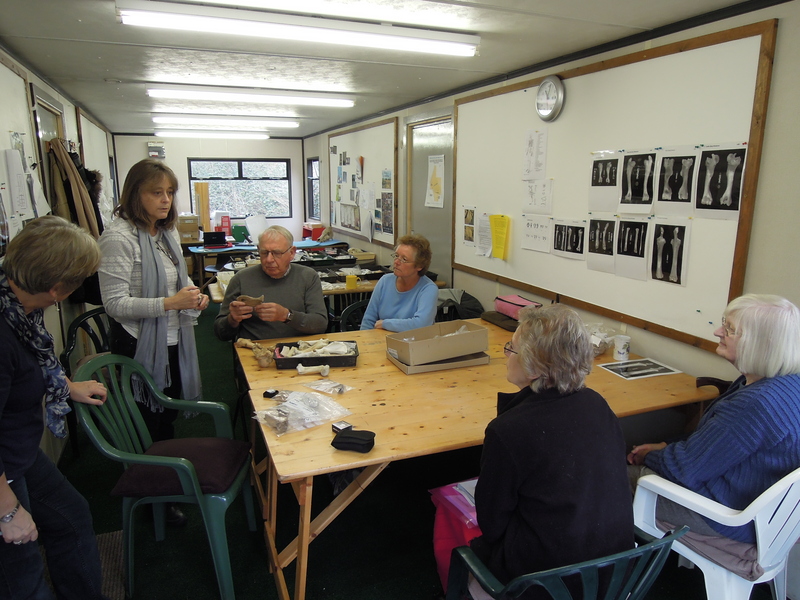 Today was our first full training session on animal bone with Priscilla, an animal bone specialist from Oxford University. Last week Paula showed us what animal bones from archaeological sites look like and explained about taphonomy – the various processes that might happen to an animal from its time of death, to when it is rediscovered by archaeologists, and why animal bone specialists often have only fragments of bones to work with. Bags of jumbled animal bones soon began to make sense as we sorted them into large, medium and small animals, and teeth of different shapes and sizes. Then, with the help of Priscilla, we learnt which part of the body the bone came from and from what animal. So far we have found bones of sheep, cow, horse, pig, deer, dog, and birds, and several small rodents. We also found evidence that a small number had been used as tools or worked in some way, and these have been bagged separately. One or two had patches of green staining showing that they had lay in close contact to a copper alloy object, possibly a coin, brooch or pin, when they were in the ground. Others had cut marks which provides insights into how they had been butchered for food. 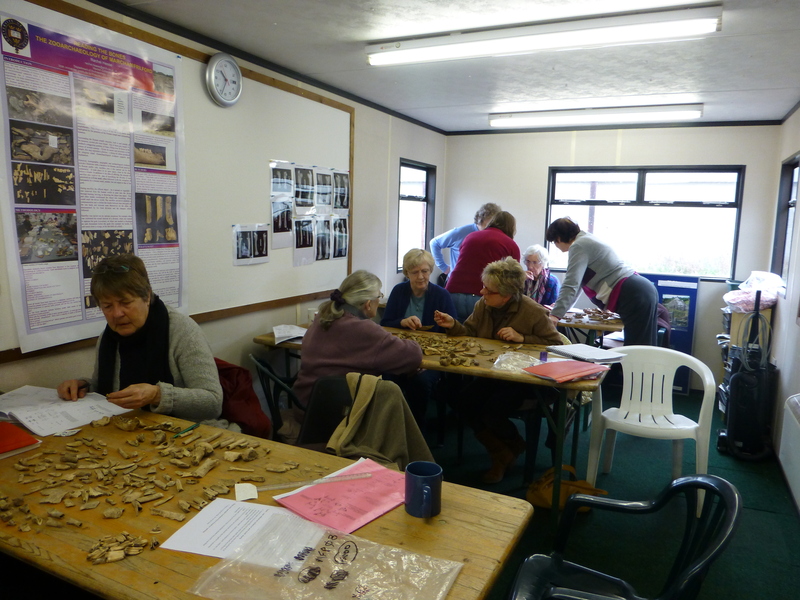 It was a good start for the animal bone team, with four boxes of bones sorted into species by the end of the day.